Voices from the east. 10 SBI contest at the end. "Singer" (歌手, Ge1shou3) is a Chinese singing show that differs from its Western counterpart in that it is a competition between already established singers. From such a large country with diverse cultural heritages and with invited international contestants (such as Jessie J who won the 2018 season), there are going to be some exciting singing styles that are not familiar to western ears. I have already featured, and plan to feature, individual artists from the show, but here I want to pick out three outstanding performances. Angela Chang is a Taiwanese actress-singer. This song is about human strength sung about a mature Tibetan woman called A Diao (translates as "Sly one"). The song has amazing vibrato control in a sweet song. 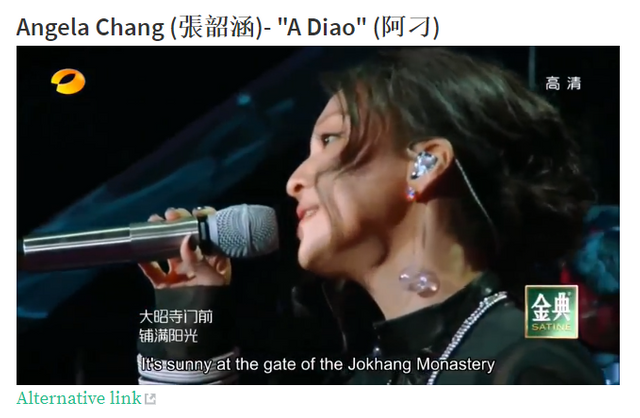 The rap bridge has a Tibetan backing singer and is sung from the silent voice of A Diao herself. This technique takes us from the viewpoint of the pitying singer and allows the more passionate voice of the subject come through. By the end of the song, the singer and by extension, the listener realised that A Diao accepts the freedom of her life. If you like your music bittersweet and your characters determinedly complex then this song is for you. Tengri is from the Inner Mongolia part of China and is aged in his late 50s. His name means "Sky" and refers to the supreme god in the Altaic religion. This is a song of love for his homeland. The song starts with some Mongolian throat singing: the droning noise sounds a bit like a didgeridoo. The flute-like overtone is sung by the same singer - it's not a separate instrument. Tengri's singing style is passionate and the power clipped and restrained. You can feel the power and emotion building until he can hold it no more and he releases it in wolfy hoooooos across the steppes stadium. These are sounds unfamiliar to a stage performance but are precisely how you sing when your homeland sings with you. "Chill" is the ending theme song from fantasy TV romance "Eternal Love" (三生三世十里桃花). The show's title translates as "3 lives, 3 worlds and ten miles of peach blossoms". To give an idea of popularity, it has over 50 BILLION views. The original TV show song (subs available) is sound mixed appropriately for the credits of a TV drama, but I love the live version because Ms Zhang explores the personality in her voice. Female Chinese pop-singers often have a thin breathy style that sounds very young but, in this performance, there is a plum-chutney-like richness in Ms Zhang's voice that will only grow as she matures. I'm a sucker for diction, so the way Ms Zhang sings "hua zuo" (1:55) the first time gives me goosebumps. Aksa and Bichen are both much more powerful and freer in their duet, and the live arrangement has their voices overlap more. "A Diao" and "Heaven" both showcase singing styles that are unfamiliar to western ears and are great studies for those interested in vocal technique: "Heaven" for the power that is held back before being released and "A Diao" for the perfect vibrato control. "Chill" is a well-performed live duet where personality raises a song above studio polish. There are many other great performances from the Chinese talent shows. I will showcase particular artists in future articles. But, if you think I've missed a performance, then please let me know in the comments below. Did I mention my diction addiction? And what is that? Diction is the way that a singer voices the words. Diction is a mixture of the accent, syllabic stress, prosody, annunciation and timing of the delivery. Rihanna is a master at diction because she uses diction to give variety to repetitive lyrics. Anyway, the contest is to find somewhere in one of the above three songs where the diction is goose-bump inducing good. Please specify the song, the time within the song and the particular lyrics as best you can spell them. 10 SBI for the winner. 1 SBI each to the first 3 guessers. I am trying to learn some songs in Chinese. I really don't know the language but I watch lots of wuxia and fantasy series from that country, and I've always loved the tratidional guzheng and erhu as one of my most favourite instruments. A competition for already established singers, nice. I expect this to be highly competitive. Lol😁 kindly correct me if I'm wrong or isn't "Singer" (歌手, Ge1shou3) a singing competition? choose one of the three songs on? The contest ends when somebody guesses the correct answer. i listened the 3 songs and i could say the one i like most was the one of Angela Chang "A Diao", her voice is really sweet and the melodic is very chinese tradicional style, i enjoyed that song!! Diction is the way that a singer voices the words. Diction is a mixture of the accent, syllabic stress, prosody, annunciation and timing of the delivery. I'm looking for a particular part of one of the songs where the diction is good. Similar to how I explained Zhang Bichen's diction when she first says "hua zuo" at around 1:55. No. 1 SBI sent for your first guess. Truly awesome diction in this song. "wǒ ài nǐ wǒ di jiā" is better translated to "I love you, my home". Homeland is probably okay given the context of the song (jia is home, guojia is homeland). Ai directly translates as love. Anyways. HINT: The part I am looking for is not in Tengri's song. I'll leave the guessing game to others. Great music though. Had no idea you were into this. So I'm back to my regular posting after the HF. Man that screwed up quite the rhythm. I'm sure I'll learn all about it at steemfest. You are not going are you? Oh steemfest! Wow. Good on you. Steem isn't without its problems but the potential is greater. Steem is still a third world economy but the middle/dolphin class is rising slowly. I'm not even going to take a guess at this one. She is a beautiful singer but I don't have a musical enough ear to distinguish the right moment in the songs, especially in a different language. Hopefully somebody will get there. Mandarin isn't my first language either. But fair enough, it probably is a little hard this week. We'll I can try but it would be like trying to shoot an elephant with a slingshot. Not very effective. Say, do we get hints after every valid guess? No. 1 SBI sent for your first guess. That indeed was a huge power note! HINT: It's not during the rap bridge either. Wow, you just opened my eyes (or is that ears?) to some new types of music! I think I will come back and try your contest as soon as I have time to give a proper listen. Thanks for stopping by. I have some earlier posts and will be posting more. These types of programs are undoubtedly very important. So much talent in the streets that is not recognized, so little by little the world knows them. So difficult for me, a Chinese native. I have been listening to Angela's music since my primary school. I know some of her experience. So I think that in the song Angela is singing for herself, brave and strong. No idea for any diction. So I guess at 4:51 你永远都不会枯 (nǐ yǒng yuǎn dōu bú huì kū / You will never wither). No. 1 SBI sent for your guess. That is indeed a beautiful lyric with an exceptional homophone. Since my Mandarin is limited, when I first heard the line I thought it was 哭 too. HINT: The specific moment I'm looking for is in "Ah Diao". There is a list with 6 possibilities elsewhere in the comments. Can you tell me what is happening in Japan? Why? I am your good friend. 不好意思 ，我的中文不太好。I'm glad you like Tengri's song. It truly is something special. Fusion of chinese and western music at its perfection. damn, this is music at a different level! What happened to the water in your homeland? Weather changes, or something else? HINT: None needed, going to be a race to see who gets it. 1:49 when you travel down a mountain remember to bring along your Tibetan knife. Yes! 10 SBI prize sent your way. Excellent! Talent for the world. My frustrated dream is to be a singer hahaha here in Latin America there are several programs like La Voz and the X factor that look for that talent and without a doubt, I support that action. Every human being has a gift and deserves to show it to the world, perfect it. I'm glad you liked the music. I'll have a new post and contest up soon. I don´t know why, it probably is because I don´t understand the language, but I always like to hear this type of singers. I say that because it doesn't really matter the style of music they are singing, they are very captivating. Glad to meet a fellow Riri fan :) I guess I listen to so much music in languages I don't understand that diction really stands out. This contest round was a bit of a tough one - I'll rethink the contest style for my next one. Nice ones! I've already tried to learn Chinese, but I'm not succesful at it! Anyway, good songs! This post has received a 52.02% upvote from @lovejuice thanks to @minnowpond. They love you, so does Aggroed. Please be sure to vote for Witnesses at https://steemit.com/~witnesses. You got a 53.21% upvote from @dailyupvotes courtesy of @minnowpond! Nice post ! You got 96.98% upvote from @flymehigh. Earn free sbd/steem daily by delegating(renting) your SP. We share high return, click here to delegate your sp to flymehigh if you don't know, how to earn passive income by delegating your SP click here for more info Join our discord You can promote your posts. Thanks. You got a 16.00% upvote from @minnowvotes courtesy of @minnowpond! Your UA account score is currently 4.612 which ranks you at #1641 across all Steem accounts. In our last Algorithmic Curation Round, consisting of 369 contributions, your post is ranked at #53. @eturnerx has set 10.000 SBD bounty on this post! You got a 18.32% upvote from @oceanwhale courtesy of @minnowpond! Earn 100% earning payout by delegating SP to @oceanwhale. Visit www.OceanWhaleBot.com for details! You got a 44.57% upvote from @joeparys! Thank you for your support of our services. To continue your support, please follow and delegate Steem power to @joeparys for daily steem and steem dollar payouts! You got a 78.90% upvote from @sleeplesswhale courtesy of @minnowpond! You got a 78.90% upvote from @luckyvotes courtesy of @minnowpond! This post has received a 68.14% upvote from @msp-bidbot thanks to: @minnowpond. Delegate SP to this public bot and get paid daily: 50SP, 100SP, 250SP, 500SP, 1000SP, 5000SP Don't delegate so much that you have less than 50SP left on your account.